1. Prepare your journal pages before you leave. Decide what size and kind of album you’ll put the finished pages in. I like to put mine in albums with plastic pages. I have tried several different kinds. The SEI preservation series albums are my favorite. They are inexpensive, come in different colors, not too bulky and you can easily add or take away pages. The cover is blank so you can decorate it with stickers or decals you find on your travels. I like the 8×8 size, but I have also used the 6×6 size. I like an album that standard postcards (4×6) will fit in. Sometimes I like to create pages on the computer before we leave that I can journal on, but usually I just use plain card stock cut the size I want. 2.Put together a small kit of supplies you will need. I like to keep mine in a small, clear cosmetic bag I bought at Walmart. You could also use a zip lock bag. You will need: Small blunt scissors, glue stick and pen. If you are traveling by plane small, blunt scissors are less likely to be taken by security. I always have a second pair in my checked bag just in case. Traveling by car I like cutter bee scissors. These are great scissors for cutting out small detailed images. If you have room you may want some markers or colored pencils. Some people prefer double stick tape instead of glue.Choose your favorite or take both. I also like a small zip lock bag to store things I cut out, but I’m not ready to glue down yet. 3. 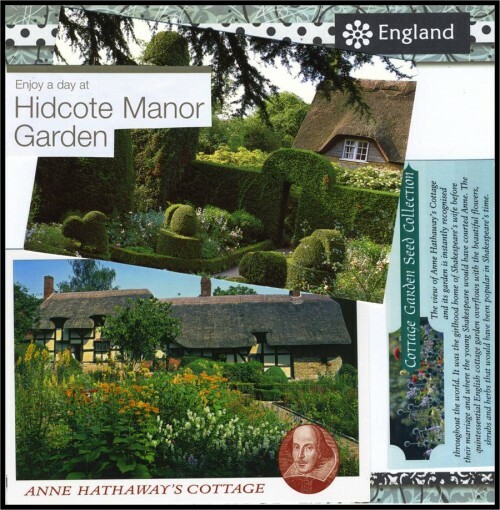 Collect free brochures. I like to look for brochures at the airport. There are usually lots to choose from in the baggage claim area. You can choose some while you wait for your luggage. Sometimes I get two copies of each to make it easier to cut things on both sides of the pages. Other places to look for free brochures are the car rental agency, hotel, restaurants, and tourist info sites. 4. Buy postcards, stickers and decals. Children love to shop for things like this to put in their journal. Save ticket stubs and other memorabilia that can be glued down. 5. Always include a page with a map of where your are going. 6. Include your itinerary with dates and who you are traveling with. 7. After a day of site seeing relax in your hotel room or by the pool and start to cut out images and decide what to include on your pages. Glue as you go so you don’t lose little words or pictures you cut out. Some brochures have interesting facts or historical details you can include. 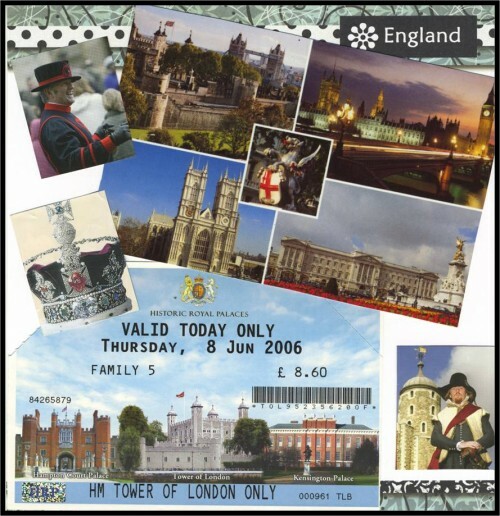 Combine postcards, tickets and the images from brochures on your pages. Overlap them and combine them in a pleasing way. If you have days with lots of hours of driving (and someone else is driving) you can work on your pages in the car. 8. Use your pen or markers to add doodles, words, arrows, borders or anything else that will make your page more interesting. 9. When I get home I like to scan my travel collage journal pages and save them as PDF files. Then I have a back up copy. I also like to load them on my ipad to look at when I have extra time. 10. Life is a journey so you don’t have to wait for a vacation to create a collage. Do a collage for each season of the year and show all the places you go and fun things you do. 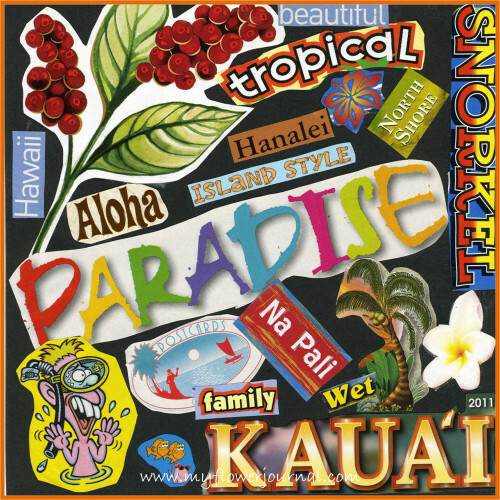 Do a collage of places you want to travel cutting pictures from magazines or print images from the internet. 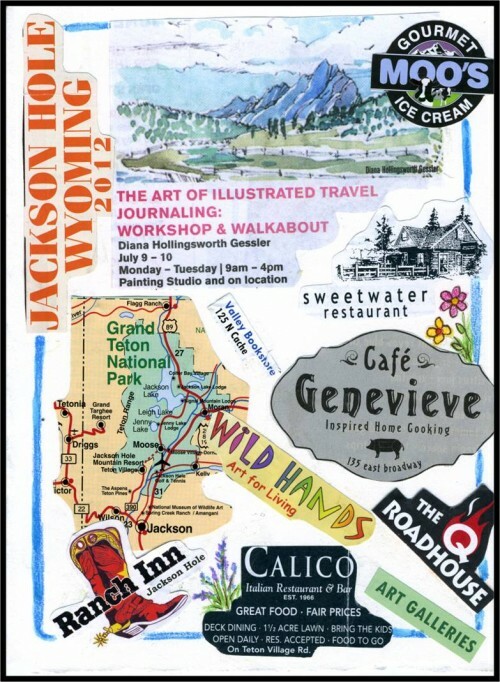 This travel collage journal page is from a short trip to Jackson Hole, Wyoming. It includes many of the ideas I have shared. It has the date, a map, where we stayed, restaurants, shops I liked and info on the class I attended there. I also used some watercolor and colored pencils to add a border and flowers. For this page I used images I cut out from brochures.I keep it in an album with other journal pages from short trips. These two pages are from a travel collage journal I did on a trip to England. I used postcards, tickets and images from brochures. I made the background pages before I left home. 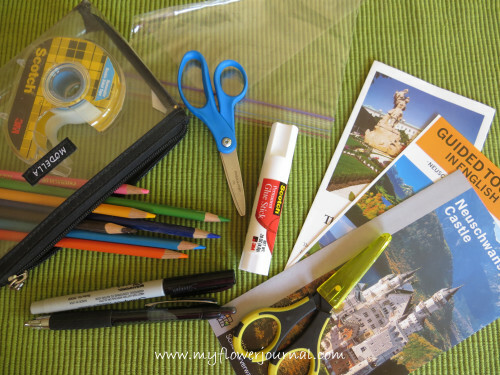 I hope these travel collage journal ideas will get you and your family started on creating a souvenir from your vacation you will treasure. You can get ideas for a watercolor travel journal in this great class from Craftsy. We do travel a lot and I promise myself that when we get back I am going to make a album /travel journal, but it hasn’t happened yet. I collect postcards, maps, tickets and other whatnots from everywhere we go so maybe, maybe one beautiful day i am going to do it! I think you are doing a great job! Enjoyed looking at your travel journal. I do the same thing and it is so much fun to put it all together when you get home- or away too. Wow! What great information and inspiring journal/travel log pages. Thank you for the tips, and thank you for your comment on my blog post. I actually had to post twice #25 and #68 because I posted around midnight and must have been half asleep! i reposted my post from last week. #68 is this week. What a great idea Tammy! This makes it easy to have it all finished by the time you get home–not feeling like you have another project to do. Thanks for sharing. I love this idea! So much more personal than keeping a brochure from places I’ve visited. So pretty! what a great idea, now if I could just get my husband to take me on a vacay!! What a wonderful idea! I want to go back and redo 20+ years of traveling so I can have a travel journal for each trip. Thanks for sharing at Inspire Us Thursday. Great ideas! =) Happy Wednesday!